Daucus carota is exactly the same species as our garden carrots. In flowers it is remarkable by its white flower head which looks like a fine lace. In fruits or in buds the summit of the plant takes a shape of cup which we sometimes call "bird's nest". Early in its blooming, the red central flower is quite visible. 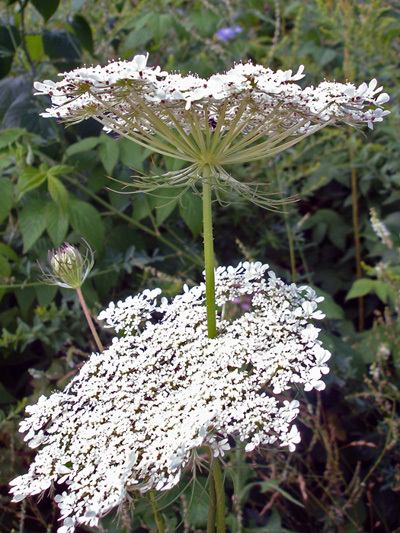 Caution: Do not confuse Water hemlock (Cicuta maculata) or the Poison-hemlock (Conium maculatum), both violently poisonous and deadly, with this species.